I make no secret of the fact that I don’t really like Thanksgiving. I’ve tried my best to see it as a time to get together with family without all the commercialization of Christmas, but all the emphasis on food just annoys me. It’s probably not surprising that as a vegan I bristle at the whole notion of a holiday focused on killing and eating a big bird, but actually I rejected Thanksgiving long before I became vegetarian. 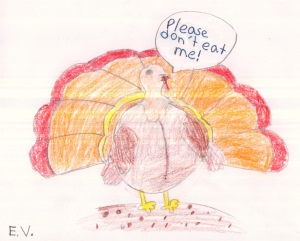 As a child, I’d complain to my mother every year, “Why do we have to have turkey? Why can’t we have spaghetti for a change?” It had less to do with my compassion for turkeys and more to do with my inherent rebelliousness. I just didn’t like being told that I had to eat certain foods on certain days. Traditions make me cranky. Call me Scrooge, or whatever the Thanksgiving equivalent is. So it’s really out of character for me to have been thinking about the Thanksgiving meal for the last couple of weeks. I blame it on this blog–and reading other food blogs–but recently I’ve been trying out recipes with half an eye toward how they would fit into a Thanksgiving dinner. As I’m serving them, I don’t announce that they’re potential T-day recipes, but the aroma of certain seasonings–thyme, sage, rosemary–conjures up the holiday as effectively as those little paper pilgrim hats we used to make in grade school. During this period of trial and error, I’ve managed to come up with three recipes that could be considered worthy of serving at The Big Feast. I’m going to give you two of them now. The third, and best, Double-Layer Pumpkin Cheesecake, will have to wait until I’ve had a chance to take photos of it later today. Cook the quinoa and lentils in about 4 cups of water until lentils are tender, about 20 minutes. Remove from heat and allow to cool slightly. Preheat the oven to 350F. Lightly oil a baking sheet. After the quinoa/lentil mixture has cooled enough so that you can handle it easily, drain the excess water and pour the mixture into a large bowl. Add all the remaining ingredients except the gluten and stir well. Mix in the gluten and then use your hands to gently knead the dough for about 5 minutes, to develop the gluten. Divide the dough in half; then divide each half in half. Then divide each piece in half again until you have 8 pieces. Flatten them so that they’re about 1/2-3/4-inch thick and shape them into rectangles. Put them on the baking sheet and bake for 20 minutes. Turn each one over and bake for another 10-15 minutes, but be careful not to overcook or they will be dry. Serve hot with your choice of gravy (I suggest Impromptu Mushroom Gravy). This is a non-recipe, but it’s what my husband really wants for Thanksgiving dinner. You can do this with any vegetables, just be aware of their relative cooking times and add them to the oven at the appropriate times. I started with a small pie pumpkin, which I cut into slices, peeled, and then cut into 1-inch cubes. Any winter squash will work instead (I prefer butternut for its delicate taste and easiness to peel). Put the pumpkin cubes into an oiled baking dish, sprinkle them with seasonings (I used thyme and rosemary) and lightly mist with olive or canola oil. Put into a hot oven (about 425F) and roast for 15 minutes. Stir and return to the oven. After stirring, you can add your quicker-cooking vegetables. I used halved brussels sprouts, but I put them into a separate baking dish because they were still wet from being washed. Do not add wet vegetables to a hot pyrex baking dish or you risk breaking it. I let them cook for about 10 minutes and then added a package of mushrooms, half a diced red onion, a few cloves of minced garlic, and some more seasonings. I cooked them until the mushrooms were tender and juicy. Then I removed all the vegetables from the oven, poured them into a big bowl, and seasoned them with salt, pepper, and a little balsamic vinegar. 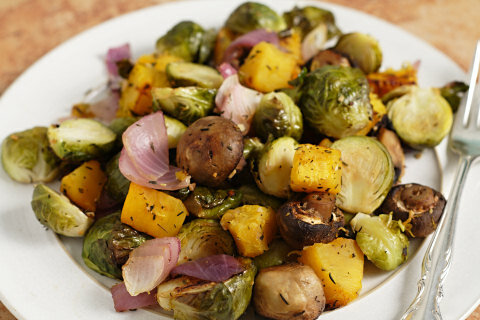 Those were just the vegetables I had in the house, but you can roast any vegetables you want. Some, like okra, cauliflower, broccoli, and brussels sprouts, take longer to cook; others, such as green pepper, mushrooms, onion, zucchini, yellow summer squash, tomatoes, and eggplant, take less time. Put them in the oven in stages, starting with the starchy vegetables, such as winter squash and potatoes, and ending with the mushrooms and summer squash. Season to taste and enjoy. Get ready for holiday decadence in my next post! I made these with millet because I was out of quinoa, and they were great. I ended up using some extra gluten because it was wet, but otherwise did everything the same. They were even better the next day. love these patties even better than the chickpea ones! they are a little lighter which is good. now to see about smoked paprika, or liquid smoke. i used regular paprika … it still came out fine. wondering what you might suggest to spike it up a bit … curry? thanks susan. i passed this recipe on to someone else and she loved reading your blog … is going to try the pumpkin cheesecake. I made these tonight (night before Thanksgiving) and will bake them tomorrow. I made them smaller and thinner than the recipe called for – I always liked my meat cutlets thin, so I figured I’d prefer my meat substitute the same way. I’ve pressed chopped (in the food processor) almonds onto the outside. I like crunchy and I’ve done it with veggie burgers in the past and loved it. I made a whole recipe and there is just my husband and I. I’m wondering if I should bake them all and then freeze what I don’t use or if they would be better if I froze them uncooked and then bake them when I need them. Maybe I’ll try both ways. Anyway, I can’t wait to try them. Happy Thanksgiving! I have quinoa flakes left over from your Thanksgiving Meatless Loaf. Would they work instead of quinoa in these cutlets? If so, would I still cook them with the red lentils? Bonnie, I made this recipe before I ever even tried quinoa flakes, so this is just a guess. Don’t cook the quinoa flakes. Add them with the other ingredients and add more if necessary to get the right consistency. I’m thinking that you might have to use twice as much to get it right. Please let me know how it works, if you try it. So the majority of personal posts on my blog are dedicated to you and your recipes. I’ve yet to try one that I didn’t fall in love with. With this one, however, deserved an extra special thank you. This will most definitely be on my thanksgiving menu as the center piece for the vegans…aka just me in reality. This with your Impromptu Mushroom Gravy…Oh man. There are so words. 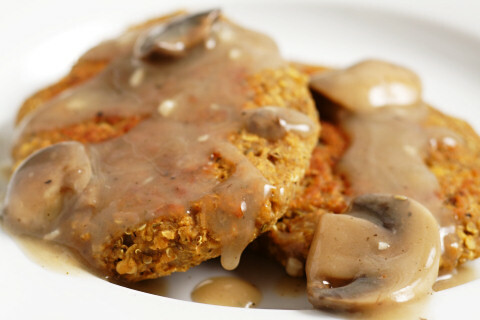 I poured all the gravy over the burgers and they pretty much turned into vegan salisbury steaks. WOWZA! Extra yum right there. Thank you so much for creating and sharing this with us. I am so thankful for you and your website. Many thanks for all the time, effort, inspiration, and creativity that goes into making this site. Any suggestions for how to make the Quinoa and Red Lentil Cutlets without using the vital wheat gluten? hi! your quinoa & red lentil cutlets look great. would it be possible for me to replace the wheat gluten with something gluten free? maybe gluten free corn breadcrumbs? please know i’m not a cook and have no practical experience with gluten replacements. thank you! best! Janine, if you can find them, try quinoa flakes. You need something sticky to replace the glutem, and they should work. If it’s something you can eat, you could add a teaspoon of corn starch too just to make sure they hold together. The Quinoa cutlets look awesome! I’ll be trying these for sure! These cutlets look so good! But can I use brown lentils instead of red? Brown lentils will take longer to cook, so you would need to start them earlier and add the quinoa after they have cooked for about 20 minutes. These turned out so great! I think I cooked my quinoa and lentils a little too long, but the end result was a really tender middle with some crunch on the outside. My kids requested ketchup and pretty soon the hubs and I joined in. They had a fantastic “fish stick vibe” according to him! For the cutlets – when can I use in place of the gluten? I am allergic to wheat. Do you think GF AP flour would work? I love your recipe and am excited to try it, I just wanted to add another perspective to your disdain over the traditional big feast and thus dislike for the day…….remember it’s about giving thanks, that’s what is most important, not the food : ). And while I appreciate and give thanks for each day, I love gathering with friends and family on Thanksgiving to honor all the love we have in our lives. My 2 cents on that subject. Thanks for sharing! i decided to put the “batter” into 2 shallow casserole dishes that fit perfectly side by side in my toaster oven. next time i will line with parchment, cuz i flipped the loaf after 20 minutes and returned to bake another 15. i served for lunch with the gravy and it was too reminiscent of my meat eating days (hubs too) so the pups got a treat!! today i sliced the loaf and warmed it in the little oven and tucked it into a mini pita with vegan mayo and lots of lettuce. it was crispy and DELISH!!! i will definitely make notes on this recipe and do it again. happy ending, happy belly!! I used dry herbs. You could use fresh, but I would at least double the amounts. My golly, Susan. If you ever put together a cookbook, I’d so want to be the freelance editor/proofreader to work with you! And I’d buy it. Still hoping that is in the future! Your recipes and Dr. Fuhrman’s are my main sources. Hi, I cooked these cutlets for dinner last night, with the mushroom gravy. They were wonderful. Thankyou so much for sharing, I really appreciate it. What purpose does the gluten serve in the recipe? I would like to try the recipe, but I have to eat gluten free. I am trying to find a substitute and it would help to know if it is for flavor or binding,etc. I’m a new visitor to the site. While I’ve been vegan for over a year, I haven’t been a very healthy vegan, and I recently decided to loosely follow Eat to Live with my fiance (omni) and 3 y/o son (GF and dairy-free). Anyway, that’s how I came upon your blog. This is the first-ish recipe I made from the site (also made the green bean and potato dish last night), and it was great! I subbed in GF flour for the gluten, and I’m sure it changed the texture, but the taste was out of this world! It reminded me of the flavors of Thanksgiving. The fiance thought it tasted a little earthy, but this type of cooking is a big change for him as well. My son didn’t care for it, BUT… we had the leftovers today for lunch, and I crumbled one into the soupy part of the green beans and potatoes, and he ate it all. I just wanted to say thanks for your blog. I love to cook, and I’ve found being vegan has been pretty easy what with all the substitutes out there, but I’m ready to move into a more plant-based, lower fat style of eating. I actually gained weight going vegan, and I wasn’t skinny in the first place, so I’m hoping this helps with my weight loss goals too. Hi! My boyfriend and I are not vegetarians but we are trying to eat less meat. We tried these patties tonight for dinner and we really enjoyed them. Thanks for the recipe! It just adds a stronger celery flavor. You can leave it out and use more of the other seasonings.